In what’s becoming a bit of a tradition, the Harrisburg City Islanders of the USL (and formerly the Union’s lower-division affiliate) will be the Union’s first foe in the 2017 Lamar Hunt U.S. Open Cup. In an ideal world this would be a true rivalry match thanks to the proximity and history these two teams share. But the reality is this “rivalry” is extremely one-sided and far too friendly to honestly feel like anything resembling the Union’s other (still rather tepid) rivalries with Red Bulls or D.C. United. 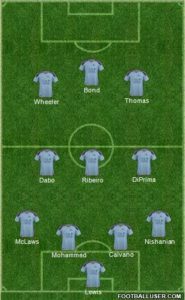 The City Islanders have used several different starting lineups in the past several USL games so it’s hard to say for certain who head coach Bill Becher thinks will give his squad best chance of an upset. Two of those players, Pedro Ribeiro and Aaron Wheeler, will be familiar faces in Chester. At 6’4″, both former Union players will be some concern in the air for the Union defense. Another player to watch will be James Thomas, the former RBNY II defender turned forward who now leads Harrisburg in assists. Harrisburg currently sit at 13th (of 15) in the USL’s Eastern Conference, seven spots below the Union’s own Bethlehem Steel FC. Historically, the Union are one of the MLS clubs who take the Open Cup seriously. It’s entirely possible that, at some point in the tournament, Jim Curtain will have his best eleven take the field. But even the Union will use these early stages to give their depth a chance to stretch their legs. John McCarthy, having built his reputation in Open Cup play, is all but guaranteed a starting spot. A back line of Giliano Wijnaldum, Richie Marquez, Josh Yaro, and Keegan Rosenberry would typically seem overkill, but with every one of those players looking to find their way back into the regular game day rotation, they’ll have plenty to play for. That doesn’t mean Jack Elliott or even Auston Trusty would be surprising selections, especially since height will reduce Harrisburg’s chances to steal a set-piece goal. In midfield, Alejandro Bedoya and Haris Medunjanin will be back from their international responsibilities, but should take their time recuperating from traveling. Warren Creavalle and Derrick Jones should be more than capable of filling their roles. Further forward things get a bit more complicated. Adam Najem is probably the only true 10 on the roster and getting him up to MLS speed could be a priority if there’s no help coming in the summer transfer window. On the wings depth is already stretched pretty thin with Ilsinho moving to the center and Fabian Herbers still injured. Epps seems most likely to get playing time, but the other side of the field is a question makr. Fafa Picault could continue his improvement with more time on the field or Chris Pontius may get the nod. Not only would Pontius add experience to a youthful lineup, but he could feed Jay Simpson and help the Englishman find his scoring touch again. International duty: Alejandro Bedoya? Haris Medunjanin? John McCarthy vs. Harrisburg’s Forwards The keeper has been relatively quiet this year due to a head injury that caused him to miss several potential starts in Bethlehem. A strong performance in the Cup could silence any concerns about what the Union will do when Andre Blake leaves for the Gold Cup this summer. The Union Back Line. Even with a young lineup, Union defenders riding the bench will look to reassert their status on the team. With Harrisburg’s chances expected to be few and far between, any slip by starting XI-ambitious defenders could set them back. There’s no reason to expect or accept anything other than a Union win. It doesn’t have to be as definitive as a 3-0, but at no point should a Union B-Team look remotely threatened by the visitors from the capital. Blake should be listed under International Duty as I believe he is with Jamaica for their game tonight. Mot only is Aaron Wheeler tall, he is very strong, uses his leverage well, and he is sneaky. Find the first Steel game in Harrisburg this year on You Tube and watch his goal. He lulled Hugh Roberts to sleep by leaving the apparent danger area and then flashed back in once Roberts attention was elsewhere. Adam Najem playing Wednesday is a choice, because the Steel go to Red Bulls 2 on Friday. I assume the game is scheduled for Friday because the Steel then play on Tuesday on the converted Harrisburg Senators baseball pitch. Bill BEcher, HCI head coach, is a wily old fox. But he has played a basic 4-2-3-1 since you tube began to carry USL games. I have seen them live four times rangng from them visiting West Chester United in West Chester, to them hosting Richmond on City Island a few years ago, to both home games against Bethlehem. My virtual experience courtesy of you tube is greater. Becher likes pacey flank midfielders, and he has some this year. Cardel Benbow may not be recovered from injury yet, but he won this year’s first game against the Steel in Harrisburg. Jonny Mendoza got hurt late in the game at Lehigh slipping on blacktop. Travis Bent may be recovered from the groin pull he suffered against the Steel in Harrisburg. Lee Nishanian has been a fixture at left center back. the Mohammed player is part of the double pivot along with Olyasibi. Sean McClaws is the right flank back. if the first choice flank mids are healthy, Jamie Thomas is the left back. Brandon MIller is the goalkeeper. Danny DiPrima and Paul Wilson have played at attacking center mid. All spellings are from memory and not re-checked. Becher played a lesser side against the STeel at Lehigh to ensure his stronger side played Reading tin the open cup so they had every chance to make it to play the Union. That he lost was a surprise I am sure because it was a first, and he brought his heavy offensive guns off the bench, ending the shutout and making the game nervous late until a PK in stoppage time put it away. They will be highly motivated, highly.